Pro-Parkway interests have City and business resources behind them. Getting our voices organized and heard is a bit more difficult. We still encounter people who know nothing about City plans for the Parkway corridor or know anything about the costs of these plans. Pro-Parkway interests have well-funded engineering studies to quote (or ignore if they don’t agree with them). They want to ignore the human and societal impacts of their plans. Opposing these interests is going to take work. Are you willing to help? Find out about our immediate needs in the drop down menus under “Act Now!” above. If you don’t want to see our greenways converted into four lane roads, you must spread the word. To your friends, to your families, to groups you belong to, to co-workers, to strangers. Tell them what is happening. Read the material at this site. Print it out. Pass it on by mail, email, or by word of mouth. Tell everyone you know that people must Act Now and Tell Council! Tell your friends about our campaign and send them links to this website. Consider writing to the local newspapers. Do you belong to a national or provincial organization with an interest in the environment and greenspaces? If so, write to them to let them know of the City’s plans. If you see pro-Parkway comments in media, check here for arguments against the Parkway. There is already a lot of questionable material and comment out there. Challenge them. Follow us on Twitter. Link to our website posts through your own Facebook pages. Do you have a short essay on the Parkway issue? Do you have a personal story on why the Parkway greenspace or Jackson Park is important to you? Do you love walking, running or cycling the Parkway Trail? Do you have great pictures? Let us include your voice. Please, e-mail us your essay, story or pictures. We need volunteers for all sorts of things: write articles and letters, phone people, hand out pamphlets, mail out material, meet with community groups, ask questions, send out and retweet tweets…the list goes on. If you can spare some time and energy to work with us, our campaign will be that much more successful. We need you. 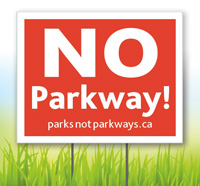 If you are interested, please send your contact information and information on how you are willing to help to volunteer@parksnotparksways.ca . As mentioned, we do not have city resources or money to use. We are all volunteers. While many donate time and resources, it costs money to pay for printing, admission to public events, research, advertising, communications…the list goes on. Our spending is very modest and full accounts are available to anyone who donates. If you can spare a few dollars or what ever amount makes sense for you, it all adds up and helps us get an alternate message out there. 739 Weller Street, Peterborough, ON K9H 4X4. This is THE most important thing you can do. Tell the people who will make this decision that you do not want the Parkway to be paved over; you do not want a bridge through Jackson Park; you want Peterborough to remain green and beautiful. Here is how.